I hit another car today--not my fault--but oh how terrifying to have your child in danger! We were clipping along at the speed limit when I noticed a black sedan edging out into traffic. I thought to myself, "surely he's not going to turn left across my lane," hit the brakes, and braced for impact. No one was hurt, just shaking and scared. 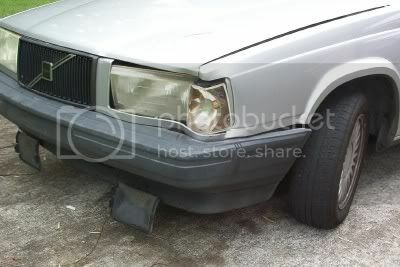 The heavy steel construction limited the damage to our beloved old Volvo wagon. In case anyone read my post from this morning, let me assure you, I had both hands on the wheel. I'm glad everyone is okay. A few years ago H missed a stop sign that was behind bushes and he nipped a car. It was scary and I would panic a little for months afterwards. Watch for whiplash. I'm glad you are ok. Sometimes it really feels like everyone else on the road is out to get you. I hope the other driver was insured. Well, he did have an insurance card but he hasn't gotten around to submitting his claim yet so I'm keeping my fingers crossed there! The damage doesn't look too bad--though I know it will cost a lot to fix. At the speed we hit his car, I'm amazed there weren't more dents. I am going to buy a new car seat out of pocket, though. Just don't feel comfortable continuing to use this one! You might want to check with your insurance company. Some will replace carseats for free after an accident. Great idea! I didn't know that.